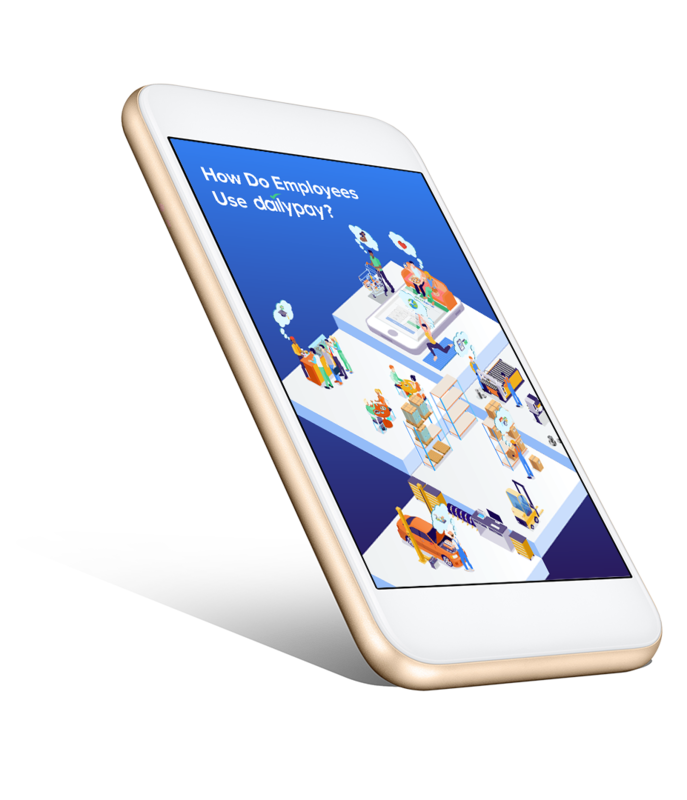 DailyPay eBook | How do employees use a daily pay benefit? 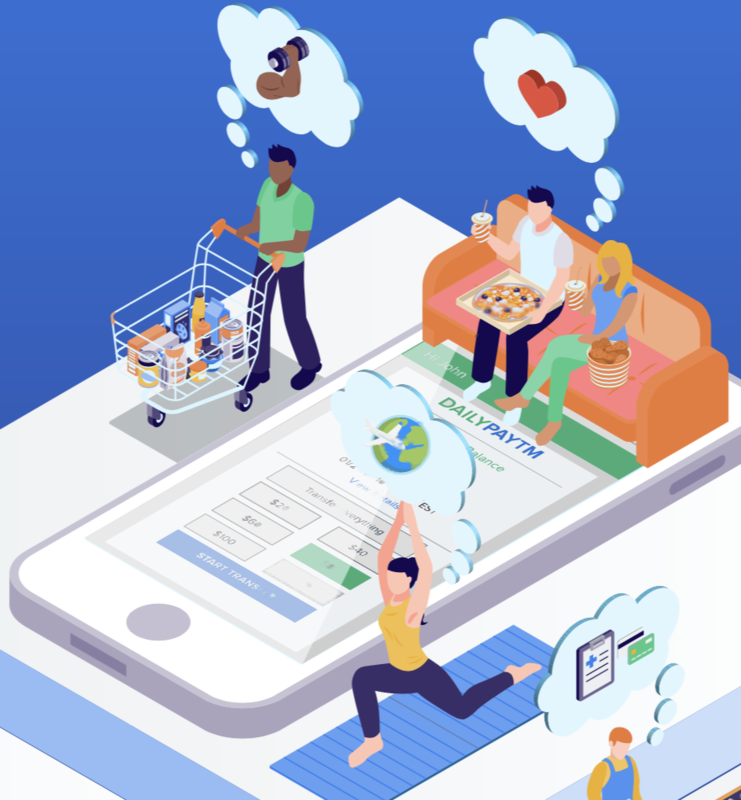 How Do Employees Use DailyPay? Employees with access to a daily pay benefit typically make transfers only when they need money—making smart withdraws that ensure their financial well-being. What does that look like? In this book we take a closer look at some examples. Like most millenials, Marty struggles to make student loan payments. When those payments don't align with payday, he faces a tough decision: miss the due date and pay a late fee, or add the payment to his growing credit card debt. How does a daily pay benefit prevent fees and interest from piling up? Eleanor is a new parent with a lot of new expenses, particularly diapers. If Eleanor could get access to earned wages just a day or two before payday, she could take advantage of deals that let her buy diapers in bulk. How much could she save by buying in bulk using daily access to wages? Auto problems know no schedule. When George & Rhonda's car breaks down and insurance won't cover a rental, missing work is not an option. A payday loan to cover the expense seems like a quick fix to stay on their usual schedule. What if they had access to a daily pay benefit? Complete the form to the left and you'll get our 10 page illustrated eBook. This book takes a deeper look at how instant access to earned but unpaid wages can save employees from cascading debt, fees, and overpayments that prevent them from reaching financial freedom. In 2017, underserved consumers spent $173.2 billion on fees and interest across five financial product categories. A full 35% of Americans with credit files have debt in collections. Astonishingly, 25% of households pay one bill late each month. How Do We Break The Debt Cycle? If you're concerned your employees will misuse a daily pay benefit, read this eBook first. The rigidity of payroll cycles means employees are regularly faced payment due dates that fall in between paydays. With the ability to transfer earned but unpaid wages instantly, employees have more flexibility when it comes to stretching their dollars or account for unplanned expenses. Read more in our comprehensive book.